A place named after the science of pizza wasn't being very scientific when it came to cleanliness in the kitchen. LAS VEGAS (KTNV) — A place named after the science of pizza wasn't being very scientific when it came to cleanliness in the kitchen. 13 Chief Investigator Darcy Spears takes us Dirty Dining at Pieology. 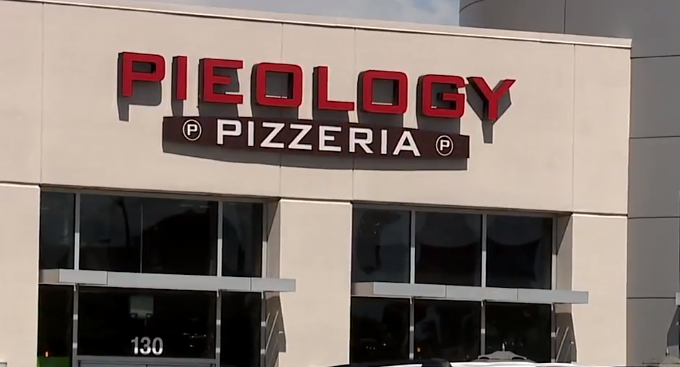 Excessively dirty, excessively greasy, heavily soiled: those words appear repeatedly in the March 18 inspection of Pieology on Hughes Center Drive near Flamingo and Paradise. The pizzeria was left with a 36-demerit C grade after inspectors found expired food including corn, house-made ranch and meatballs. They photographed a cockroach belly-up on the hand lever of a paper towel dispenser and food contact surfaces throughout kitchen that were heavily soiled with old food and grease. Wiping cloths and handsinks were filthy. There was no sanitizer in the back prep area and the sanitizer they did have set up was hardly sanitary. Menu signs, floors, inside coolers, cabinets and shelving were all heavily soiled. Dirty knives were stored as clean. A prep table and the tray on it were both dirty with leftover food. In fact, there was old food in just about every nook and cranny in the kitchen and slime growing in floor drains. Inspectors wrote up a repeat violation for spinach and lettuce being held in the temperature danger zone. They also found garlic in oil and vegan meat at unsafe temperatures. Bulk bags of food in dry storage were left uncovered and subject to contamination. Uncovered coffee filters were stored in a cabinet with a trash can. The vent above the prep sink was heavily soiled with dust and debris. And single-use dressing containers were soiled with food debris. When Darcy Spears tried to get someone to talk on camera, she got excuses. First they told her there was no one in charge on the premises. When she pointed out that that's a violation of the health code, they admitted there was a manager there. When she asked to speak to the manager, she was told they were too busy and she'd have to come back later that afternoon. But that would never come to pass. Before she even got out of the parking lot, the general manager called to say no one there was authorized to speak on behalf of Pieology. Pieology reopened with an A grade and six demerits on March 28. There was also an imminent health hazard closure on March 18 for no hot water at Zest Bistro's bar on Southern Highlands Parkway and Somerset Hills. The restaurant was not affected and the bar reopened the next day with a zero-demerit A grade. The owner had no comment.